Dorothy's Ruby Slippers, from the "Wizard of Oz" are seen on display at the Smithsonian National Museum of American History in Washington. Smithsonian officials are "over the rainbow" after reaching their fundraising goal to help preserve the ruby slippers from "The Wizard Oz." 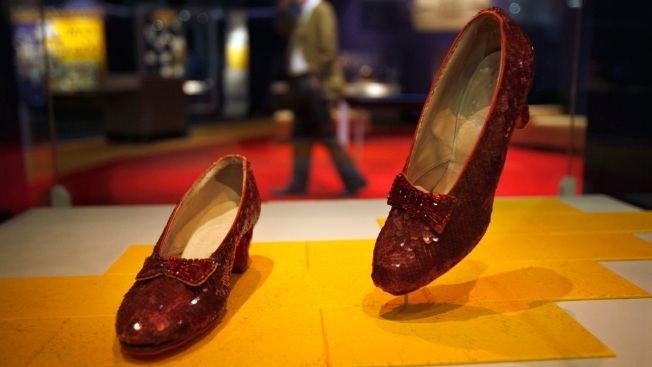 The Smithsonian launched a Kickstarter campaign last week to raise $300,000 to help preserve the slippers that whisked Dorothy back to Kansas at the end of the movie. Officials say they reached their goal late Sunday night thanks to more than 5,300 supporters in 41 countries across six continents. They say they'll announce a stretch goal Monday involving a character who traveled down the yellow brick road with Dorothy. The slippers have been one of the most beloved items at the National Museum of American History. The Smithsonian wants to put the money toward a technologically advanced display case that will preserve them for future generations.